Petersham Bible Book & Tract Depot: What's Inside? This time of year, we see pumpkins everywhere, and many people like to turn them into jack-o'-lanterns by carving a funny or scary face. Carving a pumpkin can be a lot of fun. Have you ever made a jack-o’-lantern? If you have, then you know that the first step is to find just the right pumpkin. This can be hard, because pumpkins are all very different. They can be big or small, skinny or round, and even come in different colors. 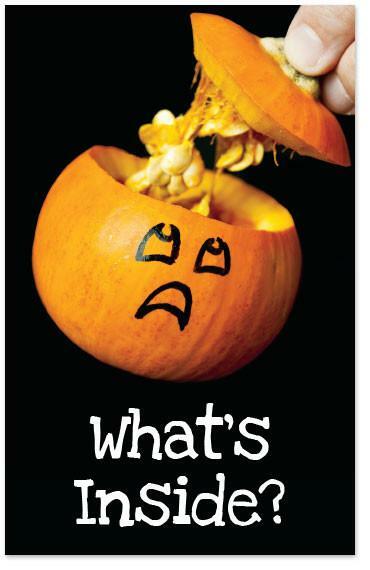 But all pumpkins have two things in common: a tough outside, and a slimy inside filled with seeds. In some ways, we’re just like pumpkins! Just like a pumpkin, we have an outside and an inside. The outside is our body, the part that we can see when we look in the mirror. The other part of us, which we can't see, is our spirit and soul. These parts, which make us who we are, cannot be seen with our eyes. But God, who made us, can see past what we can see and look at every part of us. The Bible says, “O Lord, Thou hast searched me, and known me” (Psalm 139:1). What does God see when He looks inside us? A pumpkin is filled with yucky, slimy, pumpkin goo. When God looks at us, He sees that we are filled with the bad things we have done. These bad things are called sin. The Bible says, “all have sinned, and come short of the glory of God” (Romans 3:23). Our sin separates us from God, and keeps us out of Heaven. How can we be made clean? Just like we can scoop out the yucky inside of a pumpkin to make a jack-o’-lantern, God can take away all of the sin inside us and make us clean. How can He do this? God loves us so much that He sent His perfect Son, Jesus Christ, to take the punishment for our sins. Jesus died on the cross to take away our sins, and then rose back to life three days later. This proves that He is the Son of God and has the power to make us clean! “God so loved the world, that He gave His only begotten Son, that whosoever believeth in Him should not perish, but have everlasting life” (John 3:16). 1) Admit to God that you are a sinner. 2) Believe that Jesus died for you and rose again. 3) Ask God to save you, and trust that He will! When you put your trust in Jesus Christ, God takes away your sin and makes you a new person (2 Corinthians 5:17). He also puts His light in you so you can shine brightly for Jesus! Father which is in heaven” (Matthew 5:16).